Rosh Hashanah begins at sundown tonight and millions of Jews around the world will celebrate the coming of year 5771. The typical way to begin the high holidays is to have something sweet after services and then have a huge holiday feast, usually on the kosher side. For such family gatherings, it falls to me to bring the cheese. While I love my heritage and respect the traditions and laws, I have to say…I HATE parve cheese. Parve cheese is kosher-accepted cheese, sometimes made from soy rather to insure no animal rennet mixes with dairy, a big kosher no-no. I appreciate the effort, but the flavor of this kosher concoction is rather unpleasant and the texture is more like oil than cheese. So, what’s a good Jew to do? Fortunately, there are cheeses made with vegetable rennet and while they aren’t technically kosher, these cheeses are Rosh Hashanah friendly. Thanks to my cheesemongers at my local Whole Foods, I chose three tasty treats from Cypress Grove Chevre. The first selection was easy as I have been a fan of Lamb Chopper (far left). A fresh and mild sheep’s milk cheese, Lamb Chopper has a clean and grassy flavor with some slightly sweet undertones. Next comes the Li’l Ziggy (center). Don’t be fooled by the name as there is nothing little about this soft-ripened goat’s milk pyramid. Earthy, mushroomy, with a tangy bite to the tongue, they should think about renaming it Big Zig. Finally, Midnight Moon shines down on the plate with sweet, nutty flavors (far right). This goat’s milk cheese is aged for six months, giving this ivory beauty a surprising caramel taste. All three bring great flavor and uniqueness to the beginning of the holiday season. So next time the call is for kosher, remember these celebrated options. I have even better news for you, vis-a-vis kosher cheeses. 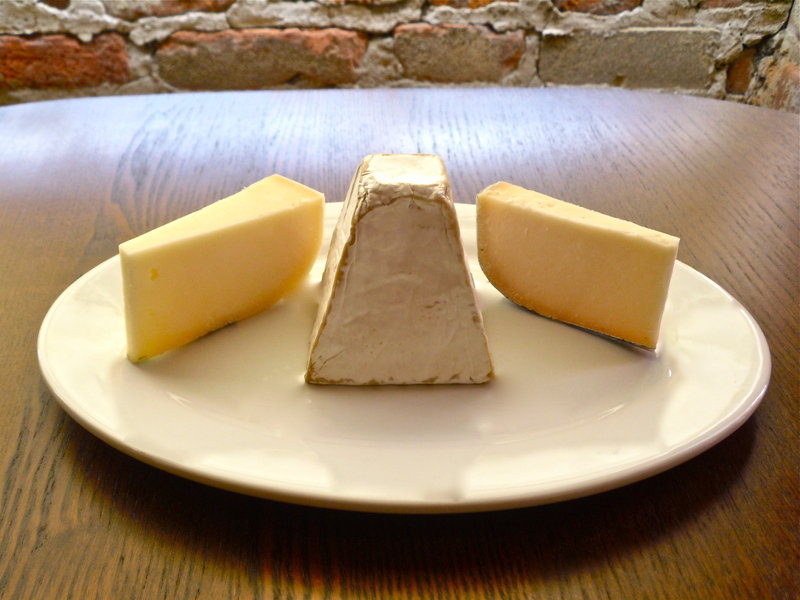 5 Spoke Creamery produces farmstead, raw milk cheeses that are certified kosher (Kof K). Our cheeses are sold at specialty retailers, including several Whole Foods and are on the menus of some of the best non-kosher restaurants in the country (Per Se, Gramercy Tavern, French Laundry, Blue Ribbon, etc. ) We’ve been written up in World Cheese Book, Cheese Chronicles and reviewed by the likes of Janet Fletcher.